A room above the rest..
A part loft conversion includes only the necessary structural work that allows you to transform your storage space into whatever you want it to be, from an extra bedroom or bathroom to an office or playroom. 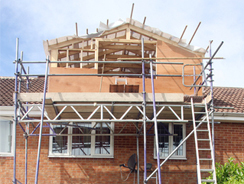 A part loft conversion is ideal for those that feel competent completing the rest of the conversion themselves, or those that want to use their own tradespersons to complete the job, such as plasterers, electricians etc. We would recommend a part loft conversion to those that have an incredibly specific vision in mind and those that are on a tight budget. Part Loft or Dormer Loft Conversion? A part loft conversion is for many the much cheaper option, but depending how keen you are to DIY and the length of time you want the job completed in can affect peoples’ decisions on whether to choose a part loft or full loft conversion. The other main concern is space. While you may have a vast loft when there isn’t much in it, the space soon fills up when you start adding furniture and dividing it into separate rooms (if applicable) so it’s important to think long and hard about the furnishings you’ll be using and how much space they require. In hindsight, many people wish they had opted for a dormer loft conversion instead. These dramatically increase the amount of head space available, allowing you to enjoy more of your room at standing height. 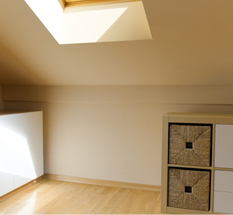 Dormers provide a much greater view of your surroundings than Velux windows, which are set into the roof at an angle. At Interloft we have years of experience of converting all kinds of lofts and we are happy to offer impartial advice and guidance about the perfect loft conversion for your home, be it part, dormer or full. Interloft provide loft conversion services in York, Harrogate, Leeds and the wider surrounding areas including the region of Yorkshire. Providing a friendly, professional and reliable service every time, we are the company of choice for loft conversions in Yorkshire at competitive prices. For more information or a no obligation quote, please give us a call on 0800 999 4034 . Interloft provide a professional and reliable service throughout Yorkshire and in particular, the Harrogate area. So, if you're looking for a loft conversion company in Harrogate then don't hesitate to contact us on 0800 999 4034 to discuss our free loft design and planning service.